The Neon Museum is getting into the spirit this year and will light up Nov. 30-Dec. 31. The menorah will be lit at Downtown Las Vegas’ Fremont Street Experience on Nov. 27. A Christmas tree lighting ceremony will be held there as well on Dec. 11. The Bellagio will unveil its winter wonderland on Dec. 6. 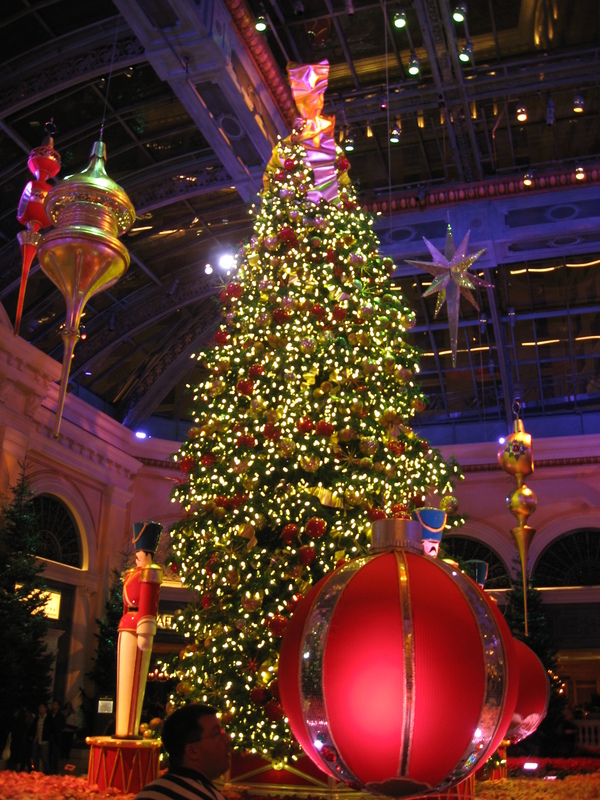 The centerpiece is Las Vegas’ largest indoor holiday tree standing at 45-feet tall and weighing 8,000 pounds. Also on display is an eight-foot reindeer crafted of chocolate and a life-size candy house. Glittering Lights will take place at the Las Vegas Motor Speedway Nov. 15-Jan. 5. Sam’s Town Hotel and Gambling Hall will host the Mystic Falls Light Park and Water Show on Nov. 27 and will also be home to Cowboy Santa from Nov. 29-Dec. 23. Wynn Las Vegas’ pastry chefs will help guests create their own gingerbread design adorned with delicious confections on Dec. 7 at 2 p.m.Or toast to the season with The Twelve Cocktails of Christmas starting Dec. 9 through Dec. 24(weekdays only). The Venetian and The Palazzo Las Vegas will host their third-annual Winter in Venice celebration, running Nov. 18 through Jan. 5. The Italian-inspired experience includes a parade, a tree-lighting ceremony, a 3-D light projection show, the return of the picturesque skating rink above The Venetian’s romantic outdoor Grand Canal and more. Terry Fator’s A Very Terry Christmas is playing at the Mirage until Dec. 24 with the curtain going up at 7:30 p.m.
Hotels and resorts around Las Vegas are hosting lavish Thanksgiving Day meals inspired by celebrity chefs from around the world including Gordon Ramsey and Jean Georges. Special Christmas menus are available at Table 10 inside The Palazzo Las Vegas, Delmonico Steakhouse at The Venetian Las Vegas, Emeril’s New Orleans Fish House located at MGM Grand Las Vegas, Dragon Noodle Co. & Sushi Bar and d.vino Italian Food & Wine Bar at Monte Carlo. For more information on family travel to Las Vegas this winter and holiday events, visit www.lvcva.com. Great photo! We did Thanksgiving in Vegas two years ago and it was stunning. Winter in Venice. I can’t wait to return. It can actually be a family destination.